Dark Side of Fortune contains all the elements of a Hollywood thriller. 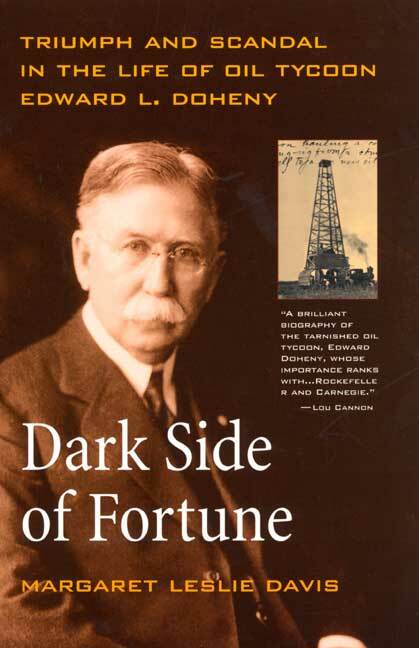 Filling in one of the most important gaps in the history of the American West, Margaret Leslie Davis's riveting biography follows Edward L. Doheny's fascinating story from his days as an itinerant prospector in the dangerous jungles of Mexico, where he built the $100-million oil empire that ushered in the new era of petroleum. But it was a tale that ended in tragedy, when—at the peak of his economic power—Doheny was embroiled in the notorious Teapot Dome scandal and charged with bribing the U.S. Secretary of the Interior. Few captains of industry have matched Doheny's drive to succeed and his far-reaching ambition. Drawn to the West in search of fortune, he failed at prospecting before finding oil in a smelly, tar-befouled lot in Los Angeles in 1892. Certain that the substance had commercial value, he envisioned steamships and locomotives no longer powered by coal, but by oil. After developing massive oil wells in Mexico, Doheny built an international oil empire that made him one of the wealthiest men in the world. But in 1924 the scandal of Teapot Dome engulfed him. As accusations mounted, he hired America's top legal talent for his defense. During the ten-year-long litigation, Doheny's only son was mysteriously murdered by a family confidant. The government's case against Doheny ended in an astounding jury decision: The cabinet official accused of taking a bribe from Doheny was found guilty and sent to prison, yet Doheny was fully acquitted. Despite the verdict, the scandal had overshadowed the achievements of a lifetime, and he died in disgrace in 1935. Margaret Leslie Davis recreates the legal drama and adds details of behind-the-scenes strategy gleaned from the personal diaries and archives of Doheny's famed defense attorneys. Previously hidden personal correspondence adds to this first complete portrait of the man and answers questions about Doheny that have eluded historians for almost seventy-five years. Margaret Leslie Davis is the author of Rivers in the Desert: William Mulholland and the Inventing of Los Angeles (1993), winner of the Western Writers of America Golden Spur Award for Best Nonfiction Book. Davis is a California lawyer and graduate of Georgetown University. She is the former editor of Arts and Humanities at the Excite Network.